I need to laminate my membership card to the J Underground. I think on the front, it will have a picture of our beloved enlightened brother: Jesus. Perhaps something cartoony that depicts an elevator: doors open, one illuminated “up” button, and a line wrapped around the corner of a city block. Just inside, Jesus is there, extending a hand to the next person in line with a tag line like, “Teach only love, for that is what you are.” Which may be too Jesusy for some. Or, it could say, “Forgive and forget,” which may be too simple. Or, it could say, “God is . . .” which may be too existential. In truth, I don’t think Jesus cares as long as the message gets through – with crystal clarity. Last month on June 18th, I had a lucid dream I will never forget. Since that dream, I have shared it with some of my close friends, my mother (to whom I tell just about everything), and a few co-workers at St. Thomas’ Church where I work. Church always feels safe to share and explore. I was in a darkened room that was filled with the kindest people I have ever known. There were many of us and I could not make out discrete faces. It was a reflection – for lack of better words – of my daily life since many of you know I have lost a lot of my physical sight in the last seven years. The dream went on for quite a while. I remember I was dressed in black slacks, a striped shirt from Chico’s, and I felt the presence of saints. It was that kind of kindness – saintly. Later, I would think I was glad not to be in my bathing suit or a pair of baggy shorts and a T-shirt. As I listened in the dream to the lecturer I was there to see, it became apparent that I, too, was there to say a few words. I am not one for the limelight but was okay when the focus shifted toward me. As the sweetness of the feeling I had continued, a lovely man of whom I could not see clearly got up from a chair and came to my side and said, “I am going to put my hands on your shoulders.” I was up for a back rub;) But, as I felt the loving pressure, I got the most relaxed I have ever felt – I then began to apologize as I felt I was drooling on this guy. And, then, by the grace of God, it happened. Like a mike drop, the scene switched instantly as I shot up out of my body. I was wholly in another world and completely aware. I looked at the crystal clear daylight and my first question was, “Where am I?” And then, I slowly turned my gaze to my right and there up on a grassy ridge was a figure dressed in white. At first, I did not know who it was. And then, it dawned on me. I recognized who it was and the second thing I said was, “Jesus! Hurry!” Slowly and steadily and surely, he began to walk down from the ridge. It was truly him. I was shocked and stunned and suspended in disbelief! He curved around in an arc as he moved my way. I think I may have said, “Hurry!” once more. But, he stayed his steady course on his way to me. It was just him (as a reflection of the Holy Spirit) and me. After a moment, he stopped right in front of me and our eyes met. I could see his eyes. He looked exactly as he did 2,000 years ago. (At least that’s how I figured it later for in the moment, I was not thinking of 2,000 years ago.) I have not seen any pictures of him in this lifetime that looked like this. He was serene, gentle, kind. His body was thin and his hair and eyes were brown. His hair was curly and sweetly framed his face. But, it wasn’t about what he looked like. It was about the joining of our holy minds together. It was the most comforting vision I have ever had. He stayed there in front of me for a long time and there were no words. We were silent in the grace. Pure love and the feeling everything is going to be okay. Everything is going to be all right. He’s got this one. It was, by far, the most complete and best feeling I have EVER experienced. I awoke in tearful joy and rolled over to my wife and said, “I just saw Jesus in my dream.” I put my arm around her and she put her arm on me. She was still sleeping and not interested in the details. But, when we shared a cup of coffee later that morning, I was glad to see that she knew my dream was the real deal. Heather gets it. She always has. Jesus is here. The Holy Spirit is here. They never left. We cannot see him with our physical eyes . . . but when the veil drops, as it did in my dream, we can and are able to see him. He’s in the one mind. He’s pure and perfect love and his message, his tag line, his hashtag and message to me and to everyone is crystal clear. He’s got this. God’s got this. It’s a done deal. God wins. So, I will continue to be a card carrying member of the J Underground. We are the spirits walking among everyone who love and forgive in the same way Jesus did then and still does now. And while it is impossible to see this world and Heaven’s world at the same time – it is possible to get a glimpse. It may feel like this world at times has no hope but there is hope. There is no death. The Holy Son of God is free. And, that includes you and me. We are all the children of God. Everyone. No one is left out. Not even who you thought was the bad guy. We live forever in the spiritual arms of what we cannot see with our bodily eyes. But my friend, when we love and forgive, we can see with our spiritual eyes. There is no expiration date on my card carrying message of the J J Underground. There is a line of people I need to forgive and love around my own personal city block – and I am doing it. Forgiving and loving with the joy that has no tag line, the joy that has no words, the joy knowing we all have this. He’s here, people. He’s in all of us. Wake up to your spirit, your reality, and you will see. I am off to laminate my card and send the blessing of his message. 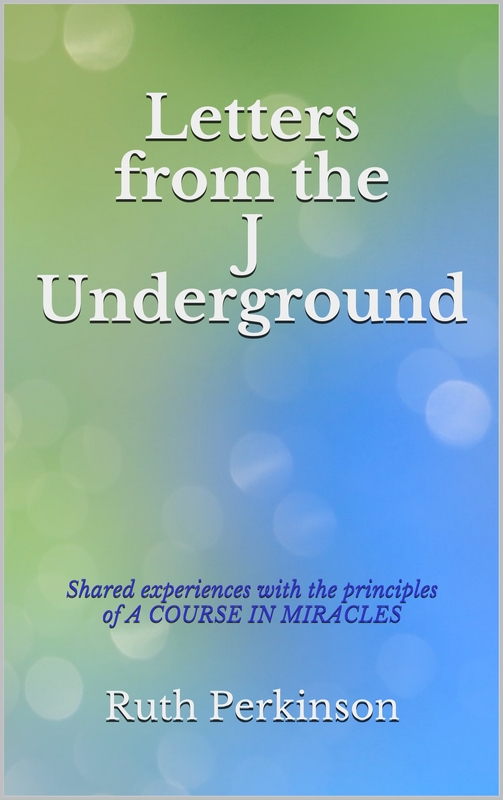 This entry was posted in Blog and tagged A Course in Miracles, J underground, Jesus, Miracle Share, silent in the grace. Bookmark the permalink. 4 Responses to Silent in the Grace . . . I so enjoy your posts! Thank you!! Thank you for sharing your amazing experience. You are Jesus’ favorite rock star fan!